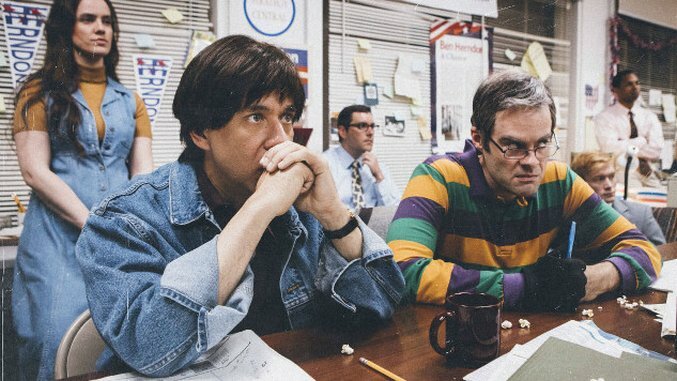 Documentary Now, IFC’s mockumentary series created by Bill Hader, Fred Armisen and Seth Meyers, opened its six-episode sophomore season with “The Bunker,” riffing on the 1993 political documentary, The War Room, which tracked Bill Clinton’s 1992 presidential run. Although filmmakers D.A. Pennebaker and Chris Hegedus were given limited access to Clinton, they focused on two other larger-than-life “characters”: the campaign’s young Communications Director George Stephanopoulos and Lead Strategist James Carville. “The Bunker” is a loving re-creation of the documentary with Armisen stepping into Stephanopoulos’ role as Alvin Panagoulious (“Boy Hunk of the Beltway”) and Hader as “the Mississippi Machiavelli” Teddy Redbones. The episode is not only timely, on point and funny as hell, but its attention to detail is astounding. From Helen Mirren’s straight introduction of Documentary Now’s “season 51” (a la PBS intros) to the hues and tones used to create the fictional 25-year-old documentary, directors Rhys Thomas and Alex Buono have proven once again that they’re not just going for the cheap laughs; they’re playing the long game, crafting one of the smartest comedies on TV in the process. Redbones and Panagoulious prove to be ruthless opponents who aren’t afraid to twist the truth and hit below the belt. Their antics are uncomfortably funny: They drive around suburban neighborhoods placing politically incorrect (aka racist) lawn jockeys next to Lester yard signs; spin a story about Lester’s overworked interns into one about “child slavery”; and pull a ridiculous stunt to try and win the election. Armisen plays Panagoulious as smarmy and charismatic political operative, but the charm seems forced; Hader fares much better as the angry Redbones, teetering on the line of sanity. Other jokes are hidden in the details, from Redbones’ mumblings (describing himself as “succubus” and “suspected arsonist”) to Herndon’s election signs that read: “Herndon. A Choice.” That the episode is written by John Mulaney—with his thoughtful and deadpan style—makes perfect sense and the perfect choice. He’s sells the BS to staff, and they buy it. Viewers will too. Christine N. Ziemba is a Los Angeles-based freelance pop culture writer and regular contributor to Paste. You can follow her adventures on Twitter and Instagram.